Maaloula, a historic village located 56km northeast of Damascus, has until recently been spared the fighting that has engulfed Syria. The town of around 2700 people is built into the mountainside at an attitude of 1500m. It is predominantly a Christian village, home to two important Greek monasteries, visited by Christians and Muslims alike. The language of the villagers is Aramaic, the language spoken by Jesus Christ. Due to the archeological and historical significance of the village, it was placed on a UNESCO list of proposed world heritage sites. Everything changed for Maaloula residents when the fighting broke out on the 4. September. The fighting between islamist Al-Nusra Front and the government forces started when a truck driven by a suicide bomber exploded on the checkpoint, held by the government forces outside the village. The Syrian Army pushed the rebels to the mountain top where there is a strategically located Safir Hotel with the views over the whole village. However, once the rebels received re-enforcements, they re-took the village. According to news agencies, there are around 200 jihadists hiding on the mountaintop with snipers covering the main road and the center of the village. Apart from the fact that the village is located close to the main highway connecting Damascus with Homs, the village is not of significant strategic importance. Maaloula only shows the sectarian nature of the Syrian Civil War. 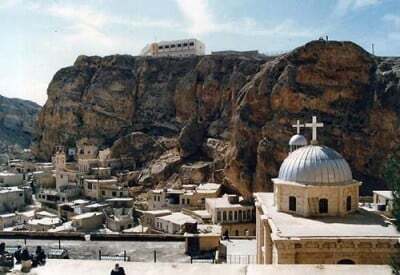 Even if they had any doubts until now, Maaloula is a representation to the 10% of the Syrian Christian population, of what awaits them if the rebels take the power. Christian support of Bashar al-Assad is reinforced by the ruthless and fanatical rebel forces, which are recruited and financed by the Western military alliance. Considering that the fellow Christians led by the United States and France are willing to bomb the country and overthrow Assad, the Christians of Maaloula and Syria see president Assad as their only protector. Sreten Mitrovic is student in International Studies and Politics.